How to get there: Approximately 49 kilometer from the E39/E136 junction (between Ålesund and Molde), along E136, there is a small place called Innfjorden. 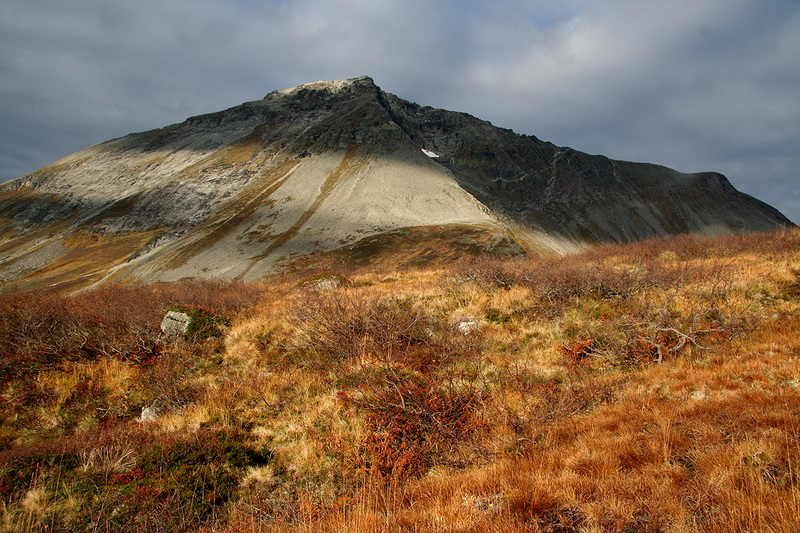 This is about 10 kilometer southwest of Åndalsnes. There is a side road here with signs for Bøstølen. Drive 7 kilometer along this road, then make a right following signs for Bøstølen. Pay toll at the self service toll station (NOK 50, in 2006), then continue more steeply uphill for another 5.1 kilometer. Take another right (still towards Bøstølen) and continue 1.3 kilometer to a fairly large parking area. One may drive another 200 meter to a smaller parking area just before crossing the creek. Park here, this is the trailhead, location N62:25.988, E007:22.989, elevation 472 meter. Route description: Cross the small bridge and head right up along the good trail following the creek that comes down on your right side. 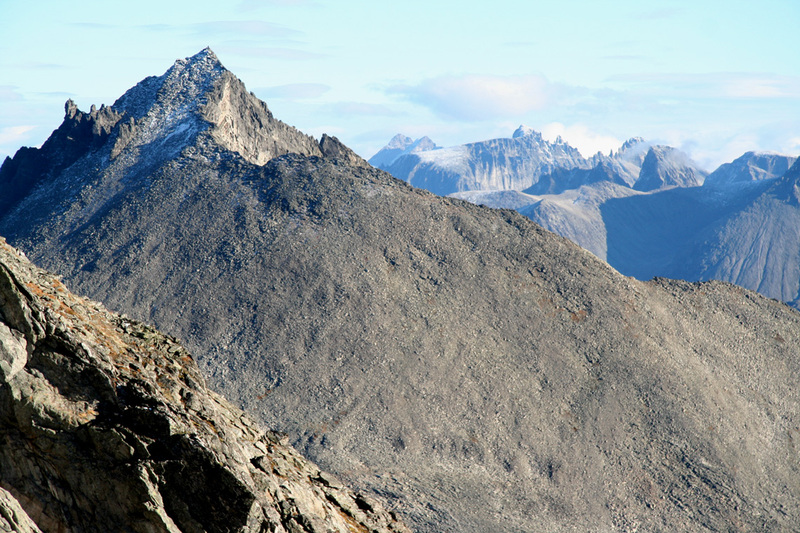 After about one kilometer, cross the creek and head up the open and easy slopes that form the lower part of the Nonstinden south ridge. 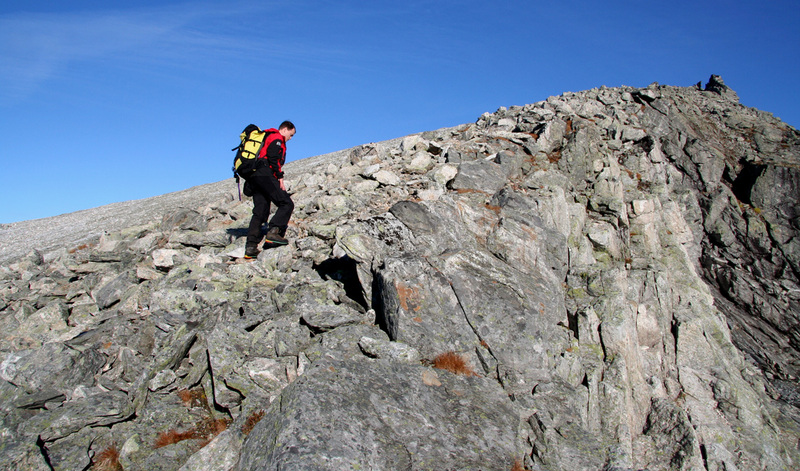 As you ascend higher, this ridge becomes only slightly steeper before it again continues with a gentle angle all the way to the summit. 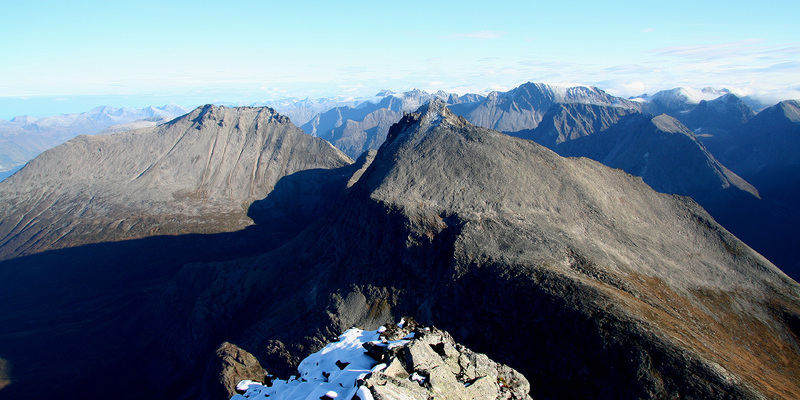 Ascending along its right side, there is much steeper slope off to the right and good views across to the shapely Middagstinden (1569m), as well as the impressive peaks closer to Romsdalen further east. There is a nice cairn with a trail register at the summit. 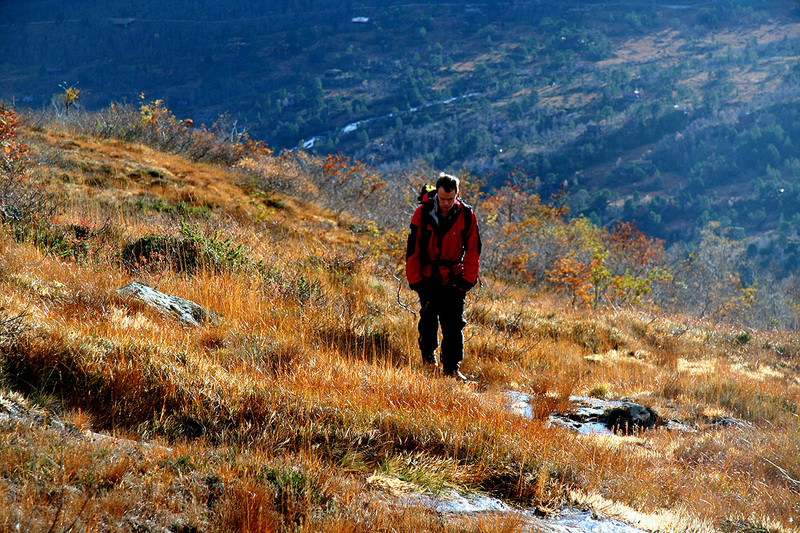 Comments: I did this hike with Anthony Dyer (an author of the book Walks and Scrambles in Norway and Arnt Flatmo. 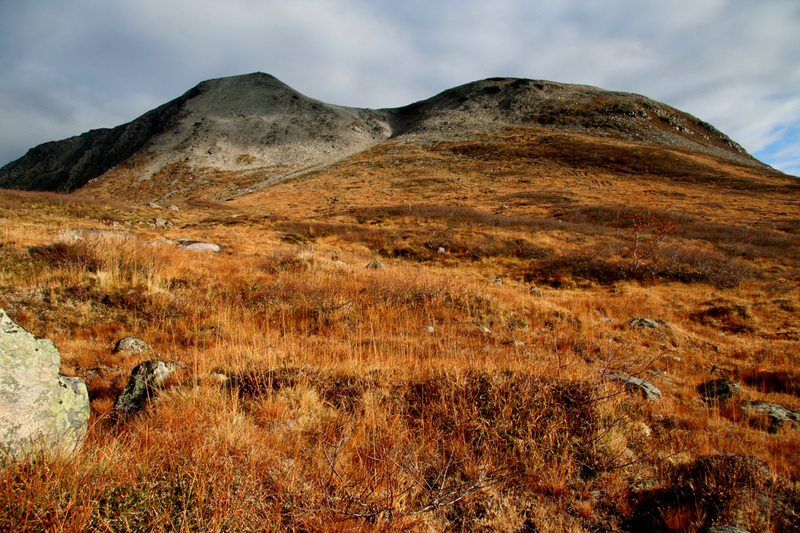 They picked me up from the Molde ferry and we drove to the trailhead above Bøstølen. There were clouds all around, but a pretty big blue patch developed right overhead. Thus, we had sunshine and a very warm and nice hike. Exceptionally overhead. Thus, we had sunshine and a very warm and nice hike. Exceptionally warm and nice for being late October. Just small patches of (new) snow near the summit reminded us that winter is actually a bit overdue. We left the car at 1100 and hiked at a leisurely pace up the gentle slope, arriving at the summit at 1345. The summit register showed only a few visits, only two since the end of July. We enjoyed the warm weather and the fantastic 360 degree panorama view until 1415, then headed back down to the car, arriving there at 1630. 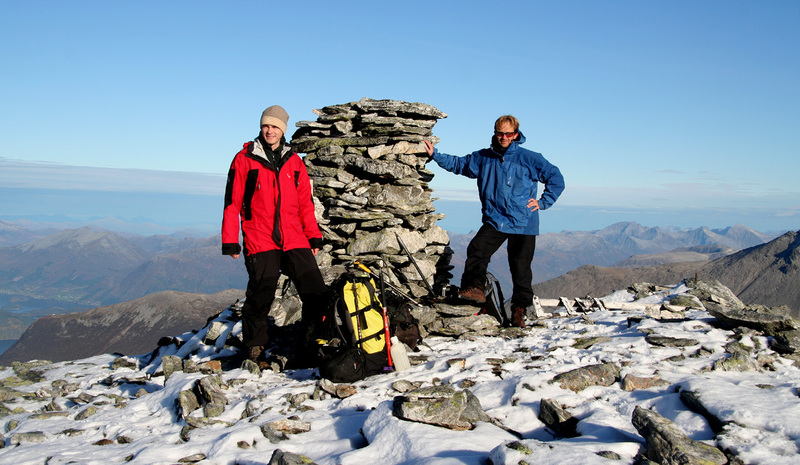 This was my last summit on the Norway "Finest 100" list located in Southern Norway. 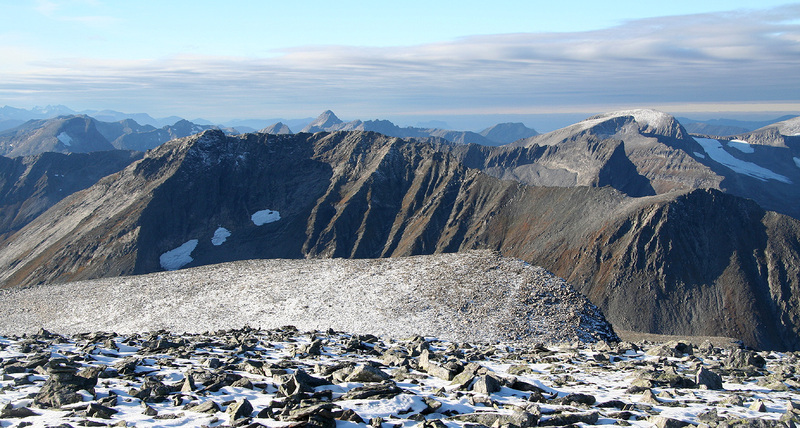 There are still 41 peaks remaining, all located in Northern Norway, an almost impossible challenge. Nonstinden. The route heads up the slope on the right. The summit is further behind. Anthony on the lower part of the slope. Litlevasstinden (1490), west of Nonstinden. Anthony on the upper part of the ridge. Middagstinden (1569) as seen while ascending. Summit view west, Lauparen is prominent in the center. 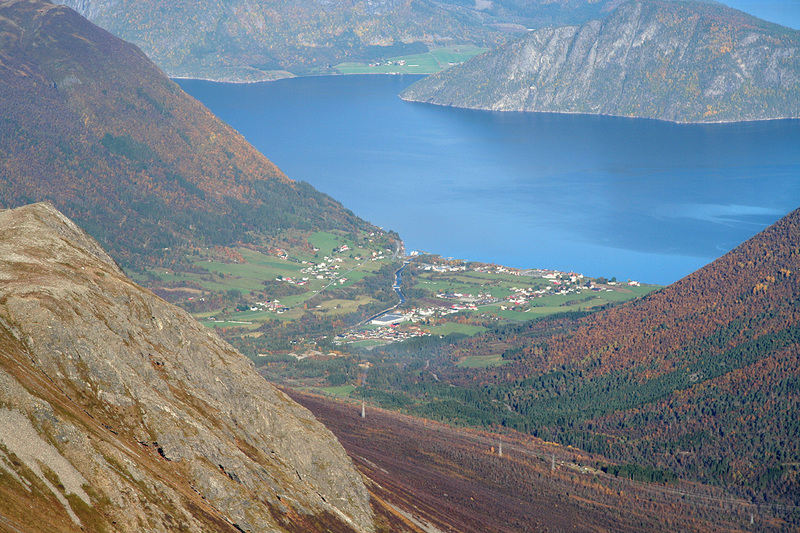 The Måndalen village by Isfjorden. By the cairn, Anthony and Arnt.